Space scientists say their discoveries about Saturn's moon Enceladus are stunning, if just a little baffling. Using the instrument-packed Cassini probe, they have confirmed that the 500km-wide world has an atmosphere. 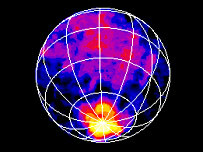 They have also seen a "hotspot" at the icy moon's south pole, which is riven with cracks dubbed "tiger stripes". But the US and European scientists told a London meeting they could not yet explain fully the energetic processes driving all the activity on Enceladus. "There were signs from a long time ago that Enceladus was a strange moon," said Dr Carolyn Porco, leader of Cassini's imaging team, "but it is just so gratifying and fabulous to see all the results come together and clearly point to a specific region on the surface which seems to be the origin of a lot of that peculiarity." The moon has become a major target of interest since the Cassini mission to the Saturn system arrived just over a year ago. Enceladus orbits the ringed planet at a distance of approximately 237,400km and is described as the most reflective object in the Solar System; its icy surface throws back about 90% of the sunlight that hits it. The spacecraft made a special low pass of the moon on 14 July, crossing a mere 173km above the surface at its closest approach. This allowed Cassini to make observations of unprecedented detail; and they backed up data obtained by the probe's magnetometer instrument on previous flybys that hinted at the presence of a water vapour atmosphere. But that was just the start of what is now proving to be a fascinating and evolving story. "We confirmed the signature that there was an atmosphere but it is a strange atmosphere," Professor Michele Dougherty, from the UK's Imperial College and the lead scientist for the magnetometer instrument, told BBC News. "It seems to be concentrated at the south pole and the best way to match our observations is that you have almost a cometary jet coming off the south pole." High-resolution imagery shows the southern polar region to be relatively smooth - usually a good indicator of recent activity - but cut by a number of long, dominant cracks. These are the so-called tiger stripes. They are about 130km long and roughly parallel to one another, spaced about 40km apart. 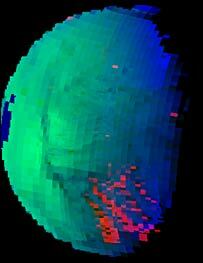 Cassini's composite infrared spectrometer shows the region to be much warmer than expected. Whereas temperatures near the equator are a frigid 80 Kelvin (minus 193C), the south polar average reaches 85K (minus 188C). Small areas of the pole, concentrated near the tiger stripe fractures, are even warmer: well over 110K (minus 163C) in some places. "The amount of heat there is really hard to understand as being due to just sunlight warming the surface," said Dr John Spencer, from the Southwest Research Institute in Colorado, US. "It shouldn't be that warm at the pole. It would be like flying past the Earth and finding that Antarctica was warmer than equatorial regions - that strange. "This is only the second place in the Solar System beyond Earth that we've seen signs of heat coming out of the interior - the other being Jupiter's moon Io." The scientists think the cracks may act like vents, spewing out water vapour and very fine water-ice particles. Some have suggested there could be ice geysers and even ice volcanoes at the stripe locations - but these have not been imaged directly. The puzzle for researchers is how to explain such an energetic system on Enceladus. As the moon moves around an eccentric orbit of Saturn, gravitational forces should subject the tiny world to some tidal heating. Radioactive isotopes in its rocky core may also be a source of some warming. But scientists are struggling to make the numbers add up and are frankly baffled as to why the activity they see should be so concentrated in just the one region. "One of the most fascinating aspects of Enceladus is that it's so very small as icy moons go, but so very geophysically active," said Dr Bob Brown, from the University of Arizona, US, and team leader for Cassini's visual and infrared mapping spectrometer. "It's hard for a body as small as Enceladus to hold onto the heat necessary to drive such large-scale geophysical phenomena, but it has done just that. 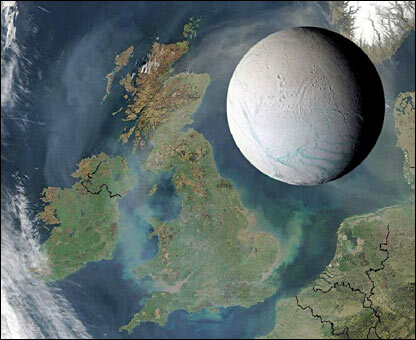 "Enceladus and its incredible geology is a marvellous puzzle for us to figure out." Certainly, what the Cassini data has done is thrust Enceladus up the interest index of objects in the Solar System that demand further investigation. Scientists may not be able to explain the "boiler" at the south pole but they are already talking up the possibility that conditions there could allow for liquid water below the surface - with all the implications that might have. "It's quite likely that this moon will now join the ranks of Mars and Jupiter's moon Europa where you might have liquid water - and the biologists could start getting interested in this being a place were life might possibly arise," enthused Dr Torrence Johnson, a Cassini scientist from Nasa's Jet Propulsion Laboratory in California. "It moves Enceladus from being a small denizen of the outer Solar System - a frozen iceberg - to something that's more of an active type world that we're interested in exploring." Cassini scientists are meeting in London this week ahead of a major conference of the American Astronomy Society in Cambridge next week. The $3.2bn Cassini-Huygens mission is a joint venture between the US space agency (Nasa), the European Space Agency (Esa) and the Italian Space Agency (Asi).